This week’s top quad was dominated by FM Leif Pressman and NM Joshua Colas. 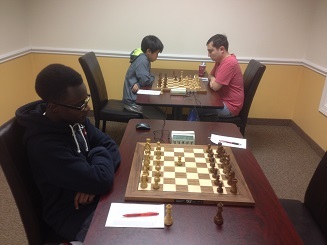 A draw between them in the final round meant they shared first place with 2.5/3 each. Daniel Cooper had the only perfect score of the night, winning clear first in the six player swiss. Guy Colas finished in sole second place with 2/3.